Our highly-qualified and experienced design team can use your existing artwork or can work with you if you need custom artwork created from scratch. Existing artwork can be modified or recreated from a sample. 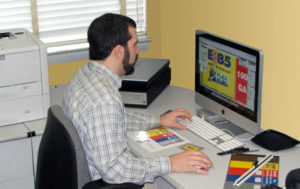 We can help you with any design needs: from the simplest decal to the most complicated engineered graphic or overlay. Our pre-press and graphics department is suited with the latest in desktop publishing applications, graphics software technology, and state-of-the-art equipment giving Nu-Art Graphics the ability to offer our customers a full line of design capabilities and pre-press services. Nu-Art Graphics has the capabilities to cater to your ideas and needs. Prior to submitting project information, please review our artwork file and format requirements. We invite you to use our general contact form for more information, or our request a quote form when you’re ready to get started!